Schuh is a chain of fashion shoe shops with 118 shoe shops in Britain and Ireland. Find your nearest branch of Schuh here. Particularly popular with teens and those in their twenties and thirties, Schuh predominantly sells branded footwear and their brands include Converse, Vans, UGG, Nike, Sketchers and Adidas. For fashion conscious teens, their gift cards can make the perfect gift. Where can I check my Schuh giftcard balance? You can check your Schuh giftcard balance by handing the card to a member of staff at any of their shoe shops. Click here to find your nearest Schuh store. You can check your Schuh giftcard balance online by clicking here. You can call Schuh customer services on 0845 307 2484. 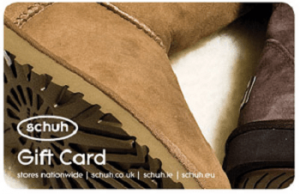 Where can I spend the Schuh gift card? Easy – any Schuh store in the UK, or online on the Schuh website. Anything else I should know about Schuh gift cards? The card will expire after 24 months if it isn’t used. Last use includes activation, topping up, making a purchase or having a refund posted to the card.